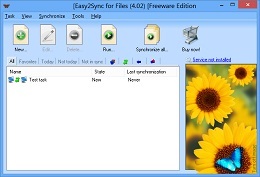 The new version 1.38 of Easy2Sync for Files is available. Apart from several smaller bugfixes and improvements the biggest news are the “Custom steps”. They allow Easy2Sync to run commands (like in batch files) before or after the sync. More info about the program can be found on the file sync homepage. The new version 3.06 is available. Just like Easy2Sync for Files, the new version now supports (with Windows 7) the display of progress bar in the task bar. Furthermore there are a number of detail improvements.